Dr Llyr ap Cenydd demonstrating his Ocean Rift virtual reality software.Bangor University Lecturer Dr Llyr Ap Cenydd from the School of Computer Science has been working on a top secret project with Samsung and Oculus to develop an app called “Ocean Rift” that is expected to launch alongside the new Samsung Gear VR mobile device. This gaming technology is so new that it isn’t even on general release yet, but will come onto the open market in the next year or so. Llyr was invited to develop for the device having previously released several game and tech demos on a similar device called the Oculus Rift. 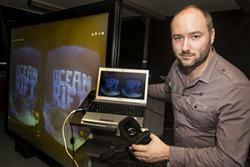 Ocean Rift is a Virtual Reality (VR) experience that immerses the user in a vivid underwater world. It gives the user the experience of swimming with various aquatic creatures including dolphins, turtles, sea snakes, rays, sharks, whales, and even extinct prehistoric reptiles. The app lets users select from a series of habitats using a touch panel on the side of the device. They are then teleported to their destination, which range from coral reefs and shipwrecks to lagoons, the deep sea and even Atlantis. There they can interact with creatures that are animated by a state of the art artificial intelligence system developed specifically for the project, which aims to produce life-like animation and behaviour. “Ocean Rift started as an experiment to see how far I could take emerging virtual reality technology to make someone feel like they are underwater. 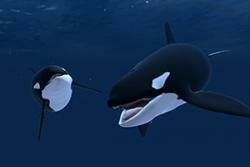 The Gear VR version takes things much further – you can swim with a pod of dolphins, stand in a cage surrounded by Great White Sharks and even swim with creatures that are long extinct. It’s been an amazing experience working with this cutting edge technology and I can’t wait for people to try it”. 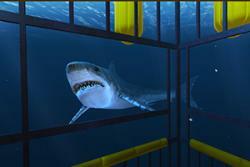 Ocean Rift will allow you to experience a shark cage!Ocean Rift will be available to download when the Samsung Gear VR launches later this year. Llyr will however be demonstrating the software on the Oculus Rift at the ALIA (artificial life & intelligent agents) symposium being organised by HPC Wales and held at Bangor University on 6 and 6 November for those who simply cannot wait to give this new technology a try! Dr ap Cenydd's post is sponsored by Y Coleg Cymraeg Cenedlaethol.